Brussel sprouts from this summer. 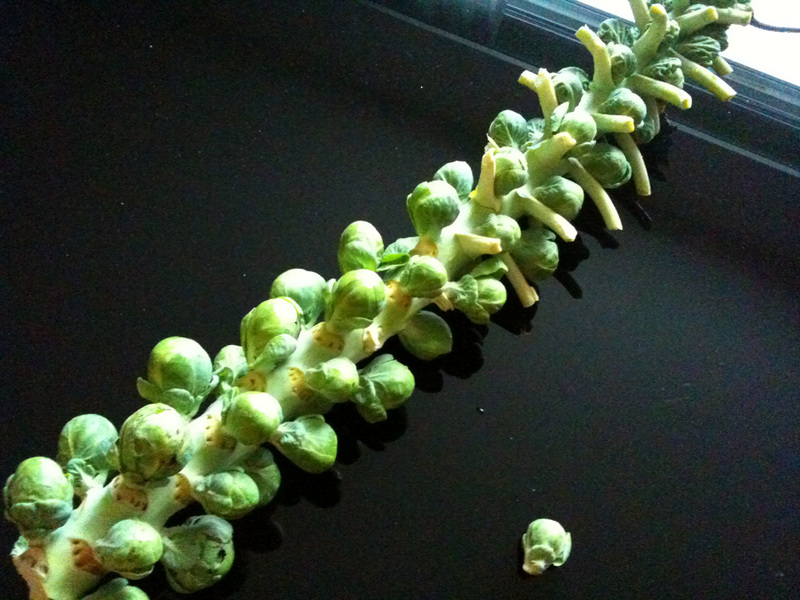 Purchased at the farmer’s market – it was the first time I realized how brussel sprouts grew. Day 12. 3 more days until I am 1/2 way through. My key takeways so far are habits and planning. Last night while preparing my delicious Licorice Spice tea, I reached into the cutlery drawer to grab a teaspoon. As I picked it up, I went “Woah… put back the spoon!”. Even though I didn’t always take sugar with my tea, I had certainly formed a habit for certain cups. Like the cup before bedtime, or the cup when it’s cold out, or I was feeling a little blue. So a habit had crept up on me without me being aware. I eat plenty of kale normally, but this has been a week of Kale. Chiefly because I haven’t planned so well for this week (I blame the holiday on Monday), and so there is no lettuce in the house for me to bring for lunch. But there is kale, so for two days in a row I’ve had raw kale salad with a few pecans and raisins. Tasty, but a tad light on the calories. I think my buddha belly will survive. Tonight I am going out for “a drink” after work. I am now a very cheap date – water and lettuce with dressing on the side please, I suspect will be the tune of the evening. But who knows. Wish me luck. This entry was posted in Whole 30 and tagged cheese, Day 12 Whole 30, habit, kale, planning, vegetarian paleo, Whole30. Bookmark the permalink.